Stockton, Calif. — Kristen Bellows, a member of HEAD’s national playing team, won the Women’s Professional Racquetball Organization (WPRO) World Championships. After a decorated junior and amateur playing career, the victory is Bellow’s first professional tournament championship. Bellows (Salt Lake City, Utah) defeated Paola Longoria (Mexico) - the WPRO’s top ranked player - in the tournament final. Bellows stormed out to win the first two games of the best of five game match before Longoria then won the next two games to even the match. In the fifth game tie-breaker, Kristen held off her opponent 11-7 to win the match and her first professional tournament. 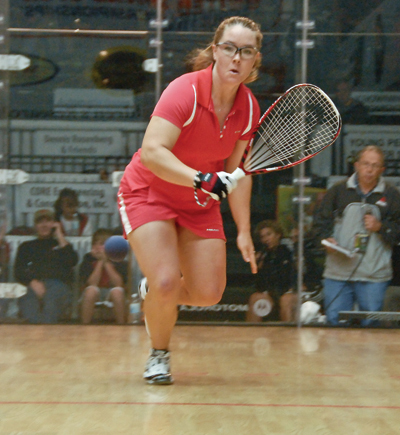 Bellows (formerly Walsh) is a full time professional player on the Women’s Pro Racquetball Tour (WPRO). In 2000 and 2001 Bellows earned World Junior Championships and is a three time USA Racquetball National Intercollegiate Champion (2001, 2003 and 2004) while playing for the University of Utah.